Summary: While we would all like to believe that a helmet could save a cyclist run over squarely by the wheel of a car, truck or bus, that is not the case. More likely the helmet's shape helped the cyclist's head squirt out the side and avoid being directly run over. On a number of occasions the press has reported that a cyclist's helmeted head was "run over by a bus" or "run over by a truck." When the cyclist dies it is not usually considered news. But if the cyclist survives, the article sometimes credits the bike helmet with saving the cyclist's life. 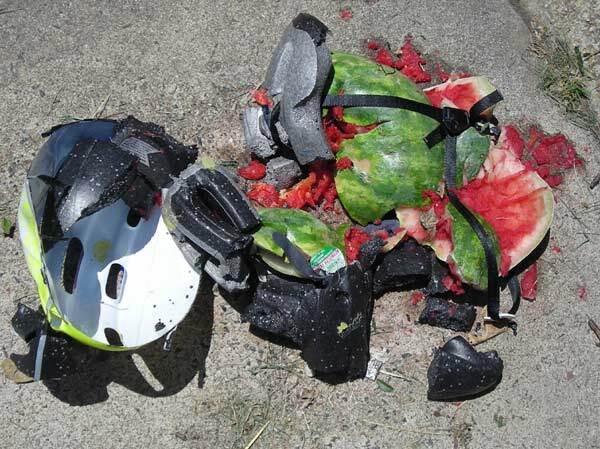 The rash of such articles occurred in May, 2007, and featured photos of the destroyed helmet. A video on MSNBC, since disappeared, covered the incident. And there was another from Urbandale, Iowa, in October of 2011. Some accounts may be found with a web search. There is no crush criterion or test in any bicycle helmet standard, and for good reason. A helmet that is capable of protecting a cyclist's head from a true full runover by a motor vehicle wheel would have to be reinforced far beyond any current bike helmet. It would be too heavy for bicycle use. When you held it in your hands, you would not be able to flex it. The number of incidents where a cyclist's head is actually run over by a vehicle, and the body is not, would be far too small to dictate that helmets for every cyclist be made unwearable to protect against that hazard. A bike helmet is designed to manage the energy of a single, hard blow, but not to prevent crushing of the skull by a huge weight. Helmets for horse riding and for bull riding are also not expected to resist the full weight of horse or bull hoof, although those are more frequent incidents in the equestrian and rodeo worlds. It is just not practical to require the helmets to protect in that situation. There is a new European equestrian "premium" helmet standard that attempts to address the crush problem, but we have not seen the standard nor any test results of helmets certified to it. Otherwise, there are no helmets designed for crush resistance on the market, including motorcycle helmets made with kevlar and fiberglass. A really strong hard shell might offer some protection, but we don't know how much. When the cyclist survives the "rollover" it is likely that the head was not fully run over, but "squirted" out the side and avoided the full weight of the vehicle. The vehicle's suspension system might help with that, allowing the wheel to deflect. The shape of a bike helmet no doubt contributes to that effect, and in that sense a bike helmet may help to convert a rollover to an "almost rollover" event. A really stiff hard shell would probably be a further advantage. The cyclist is not likely to have an accurate recollection of the event, since everything happens fast and the brain is badly shaken. It is curious that the articles never focus on the cause of the crash, or how it might be prevented next time. The press apparently does not consider the associated safety message to be newsworthy. You can read about it and see more photos on this page. It was a static test. A more relistic test would be to drive the car over the helmet at 25mph, testing what the car's suspension might do to soften the blow. But we suspect that the impact of a tire rolling at 25mph would more than make up for the spring action at the wheel. It is worth repeating that the shape of the helmet can contribute to keeping the head out from under the tire in the first place.